Located on the corner of Fashion Island Blvd at Norfolk Street next to the Fish Market Restaurant. This outdoor inflatable park offers a variety of inflatable rides and jumpers for children ages 2 – 12 and additional activities for all ages. We offer a fantastic party venue with comfortable facilities, private tents, themed parties, great activites and low cost party and group rates .Why rent an in home jumper when you can have more fun at our place. Avoid all the hassle and clean up! Have your party at our place for about the same price! So easy it is a no brainer!! Does your group want to do something fun and exciting with your children? We offer heavily discounted packages for groups and parties. All special pricing requires call ahead or online booking. 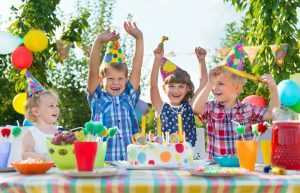 All party packages include table, tablecloths and seating for children. Outside prepared foods such as pizza, sandwiches, salads, cake and/or cupcakes are permitted. No open flames. All packages require a 25% nonrefundable deposit. Includes 1 hours jump time. Includes 1 additional hour in reserved table area. Includes 1 water per child. Includes 1.5 hours jump time. © 2018 Summer Fun Zone. All Rights Reserved.